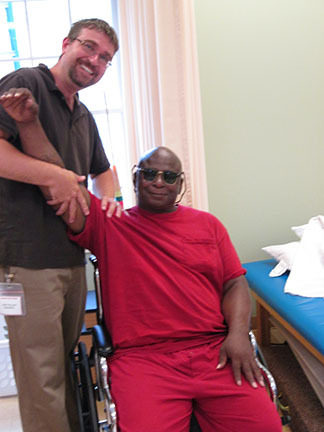 Many area physicians refer patients to Hometown, where the comprehensive rehabilitation team constructs individualized treatment programs for both short term and long term stays. The programs are reviewed as a team along with the residents and families. Goals and strategies change based on the progress and discharge destination. Families and caregivers are involved from evaluation to home assessment and trained on specific techniques and equipment that may be beneficial to the resident’s care. Hometown recently completed an addition that includes a new therapy gym featuring more than 2,000 square feet of space with advanced equipment for physical and occupational therapy. The certified, licensed Physical, Occupational and Speech therapists have the backing of a nationally recognized rehabilitation organization and are committed to helping each person regain the highest level of healing and strength. The bright and spacious gym also features a small outside patio for treating residents when weather permits. The primary goal in both short term and long term rehabilitation is helping residents achieve their goals while reaching an optimum level of function and improving quality of life. Specific care is also taken to help the resident’s family members through this transition. "The therapy here can't be beat, they are wonderful." "Therapy works you hard, but its worth it they are very good."